o Ammonium Nitrate (NH4NO3) - get a good grade, it's a fertilizer and comes in 50lb. bags. Also available from lab supply companies like VW&R or American Scientific at a much greater cost. You can also get it from high-grade instant cold packs. o Clean sand. Fairly fine grained (30 mesh or finer.) If you collect your and you get fresh water sand, it will be necessary to wash it thoroughly with water then dry it before using. You must also wash the sand before reusing it. o Electric hot plate (500 to 2500 watt) with variable heat. o Stainless steel dial thermometer. (This is the only metal item which may be used.) It must go to 250 C (450 F). Select the Erlenmeyer flask (next item) and the thermometer so that the thermometer can reach at least within 1/16" of the bottom of the flask through the stopper. o A 2000 to 4000 ml PYREX or KIMAX Erlenmeyer flask. o Several feet of 3/8" clear vinyl or surgical rubber tubing. o At least 4 8mm ID glass or plastic tubing "T's". o 1 120 degree bend 8mm ID PYREX glass elbow, with about 3" of tubing on each side of the bend. o 7 6-8" long pieces of 8mm ID glass or plastic tubing. o 3 6-8 feet long 1.5" to 2" diameter glass or clear plastic pipes. o 1 two hole rubber or neoprene stopper to fit the top of the Erlenmeyer flask. One hole should fit the 8mm ID PYREX glass elbow, and the other hole should fit the stainless steel dial thermometer. o 6 one hole rubber or neoprene stoppers that will fit the ends of the clear plastic or glass pipes. The holes in the stoppers must fit the straight 8mm ID glass or plastic tubes. If you've gotten this far - remember - you MUST meet the exact quality specifications of the equipment list. If you really want a do-it-yourself nitrous oxide generator, you want a sturdy set-up you can over and over and enjoy again and again! 1> Into the stopper with two holes, inset the thermometer far enough so that when the stopper is put into the Erlenmeyer flask, it almost touches the bottom of the flask (but don't allow it to touch), and then insert one end of the glass elbow far enough through the stopper so that it sticks out 1/4" to 1/2". 2> Into the six one-hole stoppers, insert a piece of the 8mm ID glass (or plastic) tubing so that 1/2" to 3/4" protrudes from the narrow end of the stopper. 3> Now select your set-up space so that there is 1.5 feet of space clear in all directions around the hotplate, so that the three scrubber pipes can lie side by side where they will not be knocked over. 4> Take approximately 2 feet of the 3/8" flexible tubing and connect one end to the glass elbow in the two-hole stopper, and the other end to the middle of one of the 8mm ID glass (or hard plastic) "T's". 5> With short pieces (select lengths for a neat fit) of 3/8" tubing and another 8mm "T" assemble the INLET SET manifold and connect it to the bottom end of the scrubbers. Stoppers may then be inserted into the lower end of the scrubber pipes. 6> Elevate the OUT end of the scrubber pipes so that the upper end is 6" to 8" above the IN end, but no more, and then fill the pipes with water until they are full within 4" to 8" of the top (outlet) end, and insert the outlet stoppers. Try to fill all the scrubbers equally full. 7> With short pieces of 3/8" tubing and two 8mm ID "T's", prepare and connect the OUTLET SET manifold to the scrubbers similar to the way the set was connected in step 5. 8> To the last "T" of the OUTLET SET (of "T's" manifold), connect a fairly long piece of 3/8" tubing to reach a "safe" location (where connection and disconnection of the receiver bags will not disturb the scrubbers) and secure it. Then put the last piece of 8mm ID hard tubing into the free end. 9> Finally, prepare several receiever bags by inserting about an 8" piece of tubing into the top so that 3" or 4" sticks out of the bag and secure it in place with a rubber band. You are now the proud owner of your very own Nitrous Oxide Generator. you MUST REMOVE the two-hole stopper from the flask before turning off the heat. Otherwise as the flask starts to cool off, it will draw water from the scrubbers back into the hot flask and may crack or EXPLODE the erlenmeyer flask with the steam formed inside. Now you may begin heating the flask. Turn the hotplate to medium or medium-high and watch the thermometer. If the temperature climbs very fast, turn the hotplate down, but be patient about turning it up. Occasional bubbles will be noted going through the scrubbers as the air in the system expands. At 210 C (410 F) a yellowish to orange-brown will begin filling the flask, and the bubbling throught the scrubbers will become steady. At this time, adjust the upper end heights of the scrubber tubes so that each one gets about the same amount of gas passing through it. Keep your eye on the temperature, and it should not climb much over the 210-220 C (410-430 F) marks. Also the gas at the top of the scrubbers MUST BE PERFECTLY COLORLESS! Otherwise, turn down the heat setting. If the gas flow is too low to give a steady flow throught all three scrubbers, increase the heat slightly. Once you've run your system a time or two, you'll know what your operating settings are. As soon as the gas flow is steady and clean, connect a receiving bag to the final outlet tube, and allow the bag to fill. 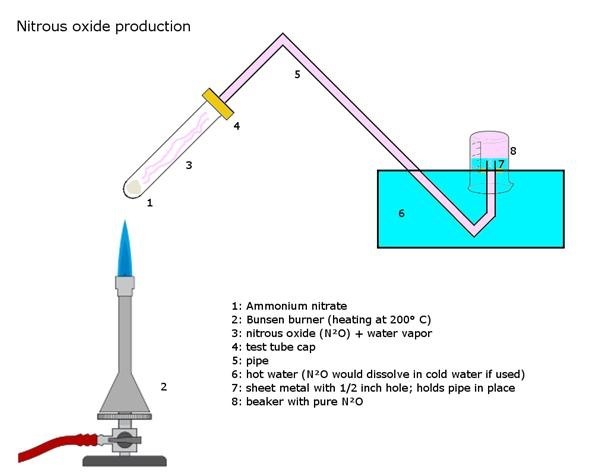 It may be necessary to add more amonium nitrate-sand mixture to the flask from time to time -- wear gloves as the flask will be HOT when removing the stopper. It is also a good idea to turn off the hotplate while the stopper is out of the flask. As mentioned at the beginning of this article, BE VARY CAREFUL WHEN WORKING WITH CHEMICALS!! Follow the procedure EXACTLY as instructed! Be careful with fire, it is dangerous. AMMONIUM NITRATE CAN EXPLODE! Again, DO NOT stray from the procedure instructions. photo by Buzzle, procedure taken from ancient text file. This sounds so fun! I gotta try it!